This shows the dictionary ordered by the Lugungu alphabet letters and allows you to see a whole letter section of the dictionary at a time. This shows lists of English words that have definitions in the dictionary. These lists are ordered by the English alphabet letters. You can click on words in these English lists to see the corresponding Lugungu words in the dictionary. This shows the dictionary ordered by Semantic Domains (Categories of meaning) and allows you to see all the Lugungu words that fall within a particular category. 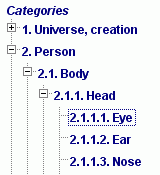 The domains are sorted in a hierarchy on the left of the screen. You can easily expand the hierarchy by clicking on the + signs to find words in an area of meaning. For each of the three Browse views you can click on the letter buttons across the top of the screen to show all the words that begin with that letter. (Note that the letters with a white background cannot be clicked on because there are no words in the dictionary that begin with that letter of the alphabet).